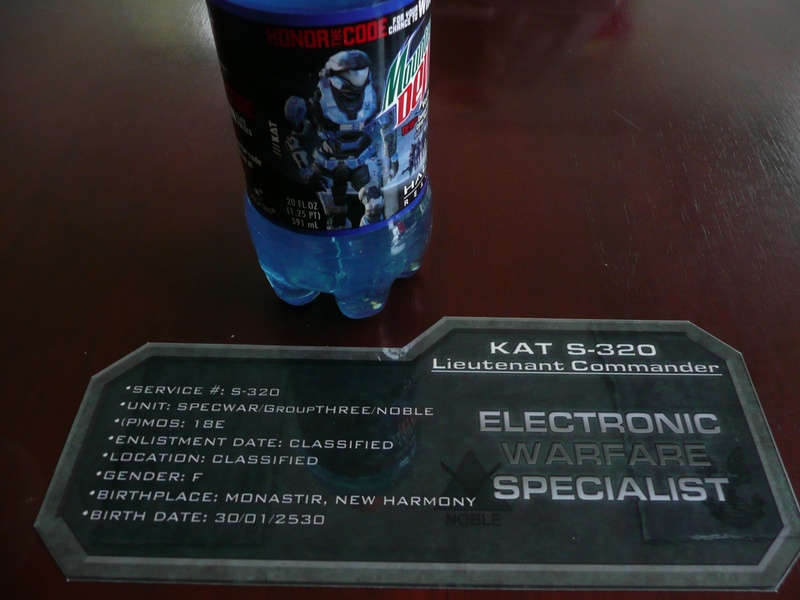 Does the World Need Halo: Reach-themed Mountain Dew? 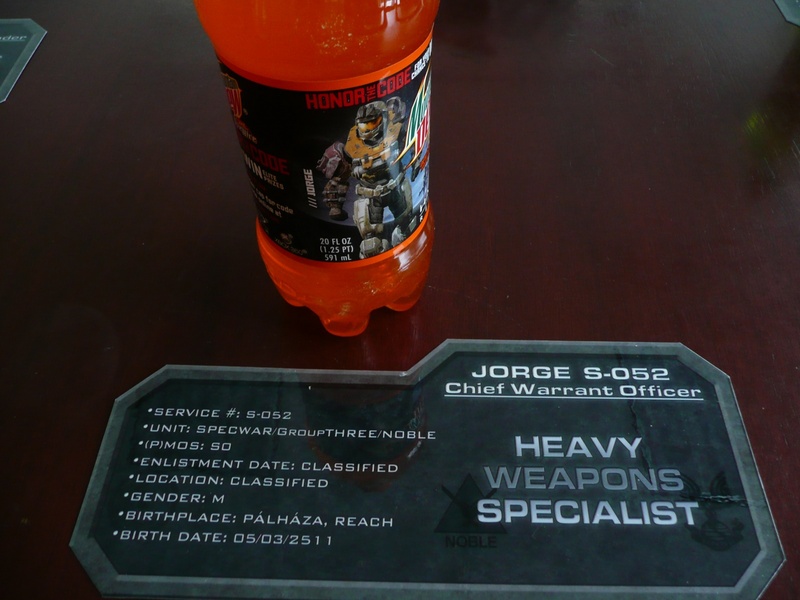 What do the members of Halo: Reach's Noble Team taste like? 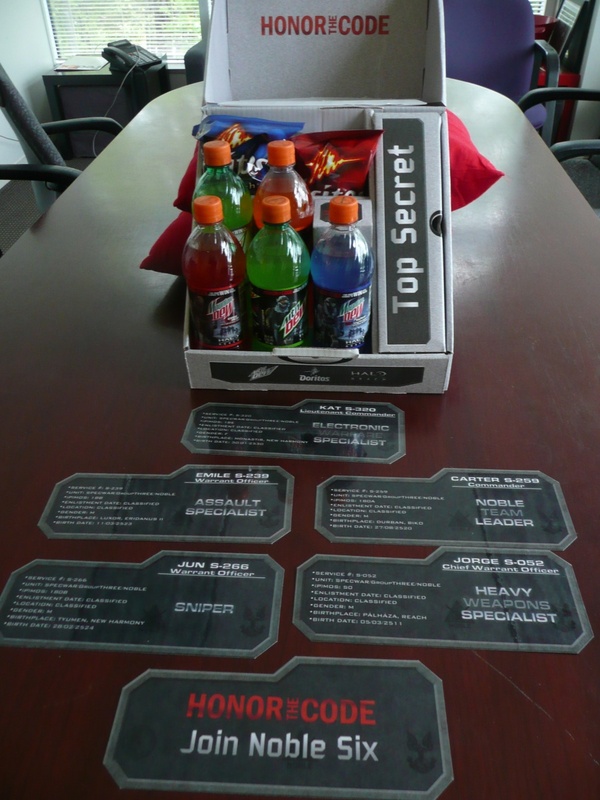 I inexplicably got a package from the Pepsi Corporation this morning that contained five different varieties of Mountain Dew for each of the Noble Team in Halo: Reach. 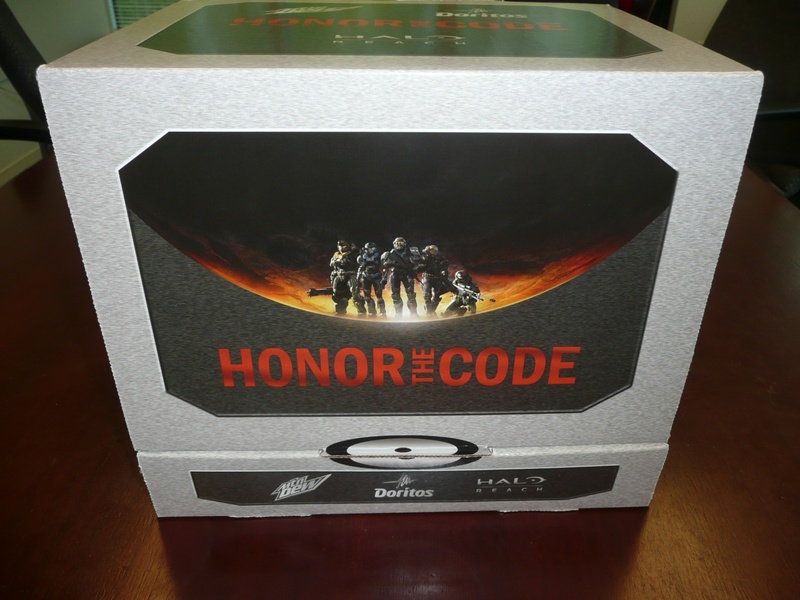 According to the marketing materials that came with the box, only 300 of these "Halo: Reach Honor the Code kits" were created. 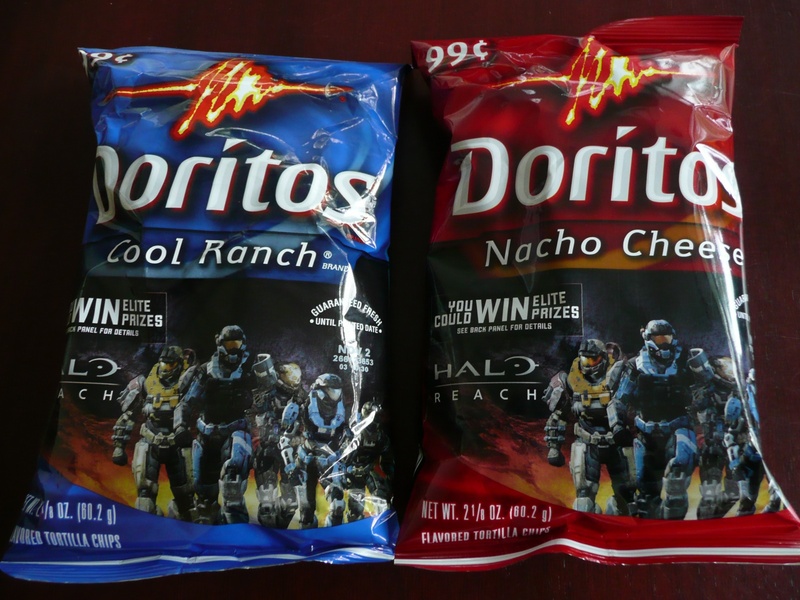 Not only did I get five bottled of variously colored sugar water, but I was also lucky enough to receive two bags of Doritos with Halo branding. "But there's more!" Isn't there always? 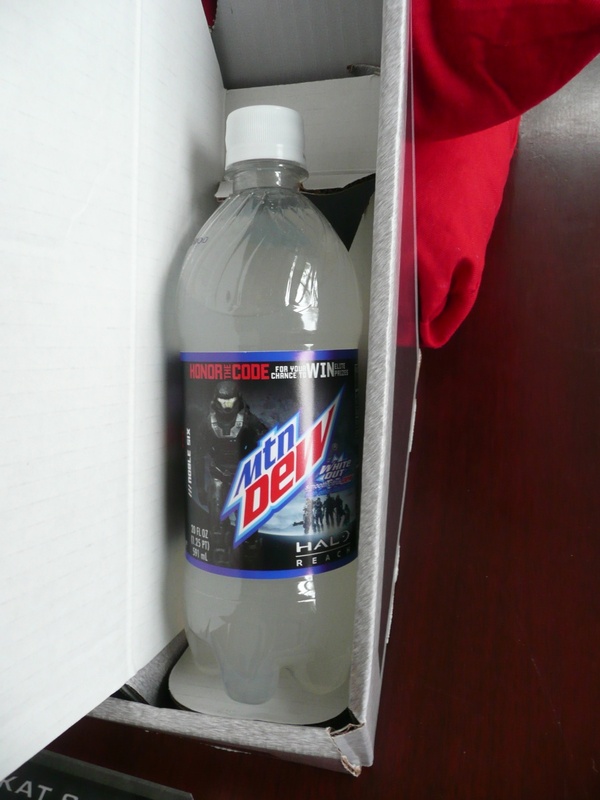 "We've also included the newest member of our Mountain Dew family: Mountain Dew White Out. You won't find this edition of White Out in stores. It's not for sale and you can't buy it. 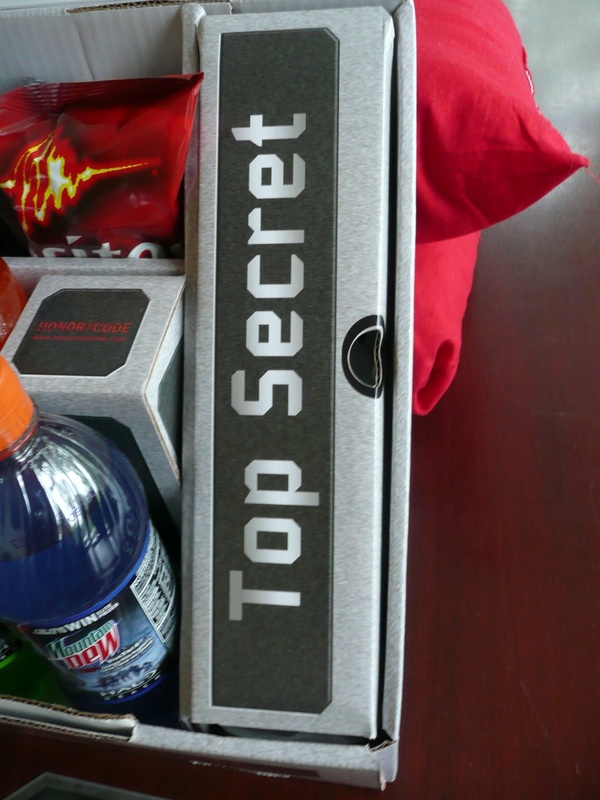 We're giving it only to true Mountain Dew fans." My only question is: How did they know?!?! I mean, sure, I love caffeinating with some Dew every now and then. It's usually my soda of choice when I'm driving across state lines at 3am. But how did Pepsi know that? Have they been following me? Is there a chip in my larynx that registers whenever that silky green soda-pop flows down my throat? I may never know the answers to these questions, but I can offer some pictures of the kit and all of the products contained in it. It's really quite glorious in its pointlessness. The D&D dork in me was happy that the kit included stat-sheets for each member of the Noble Team and that each of the flavors matched the character's armor color. Many people in the office told me to avoid the Dew flavors that "weren't green" but in an effort to uphold my journalistic integrity, I will offer you my honest opinion on these new flavors of caffeine fuel. Upon opening this bottle, I was confronted with a bouquet reminiscent of walking through fields of blue raspberries on a delightful spring morning. Wait, there's no such thing as blue raspberries. Well, in that case, Voltage tastes exactly like a blue Tootsie Pop with a ginseng finish. Yep, it's Fanta. With caffeine. I approve. 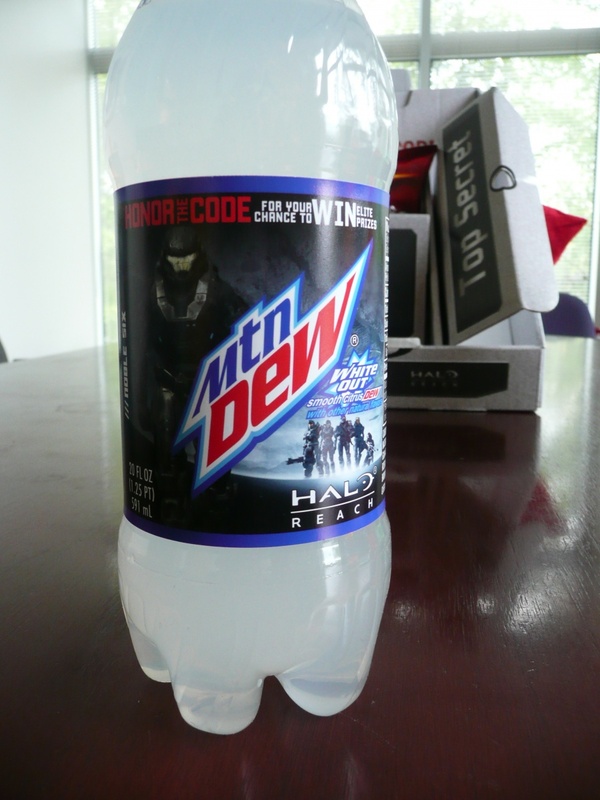 Code Red has been around for a while, but this one has a shot of cherry in it. It's actually a nice departure from the more citrus-ey flavors. 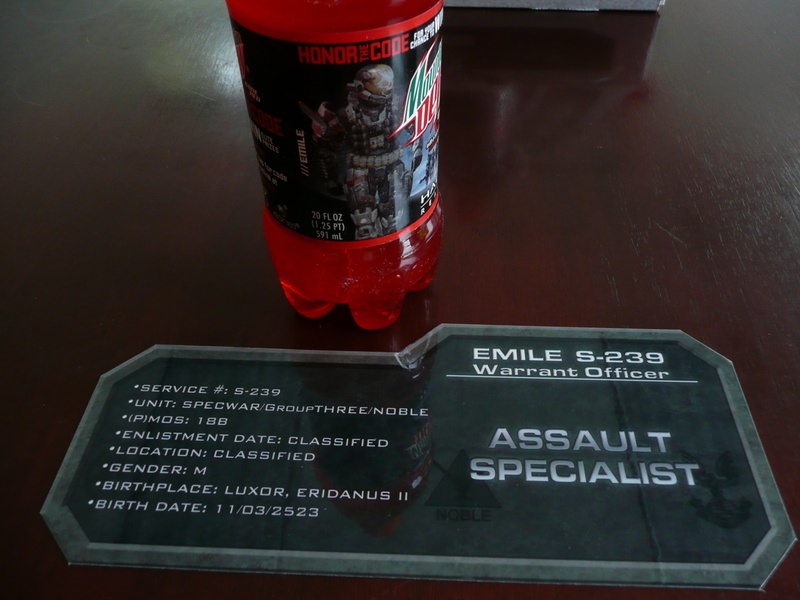 I don't think that Emile would be associated with anything with cherry in it, but as John Funk pointed out, you could think of it as blood. That's appropriately badass, I suppose. Here Pepsi really dropped the ball and screwed with the whole armor color/flavor association thing. 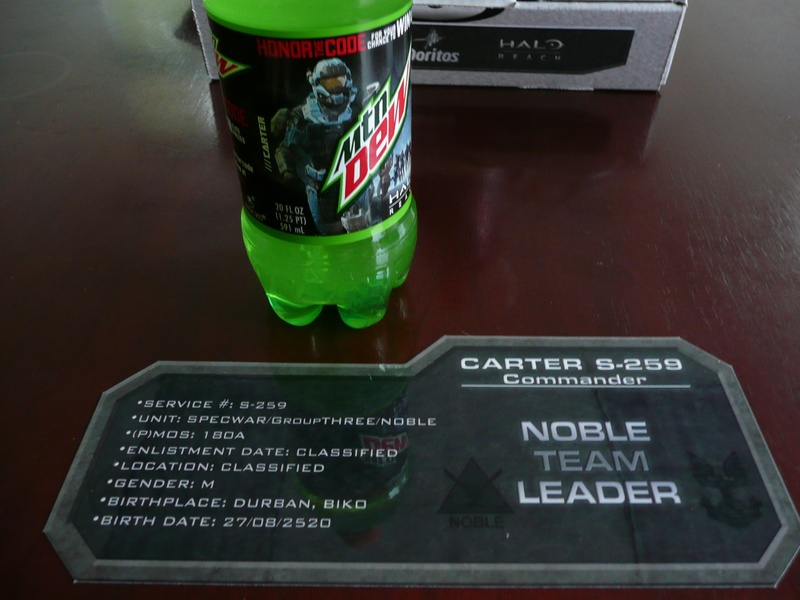 I guess it makes sense that Carter is good ol' classic Dew, but they lose points for not sticking with the system. Fail! 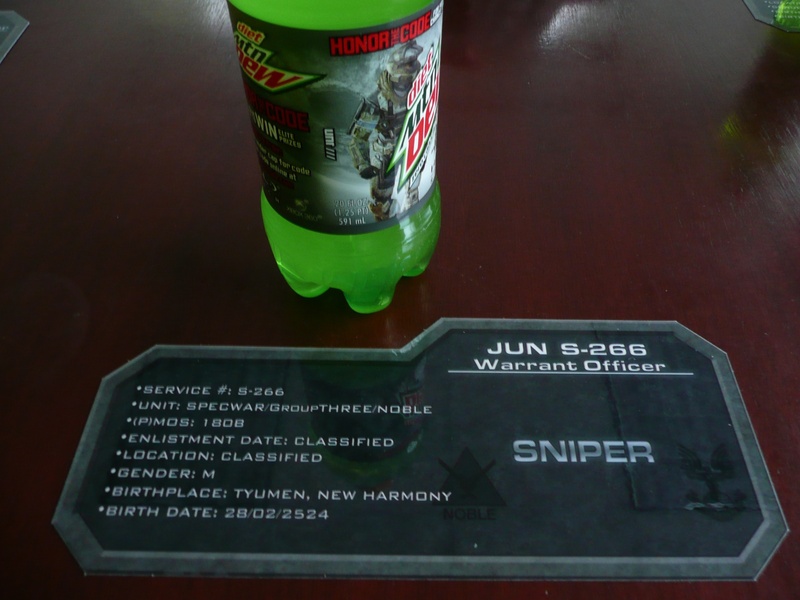 While I was at first disappointed with the fact that the smallest guy on the Noble Team was relegated into Diet status, Susan Arendt rightly pointed out that he's a sniper and didn't need to consume as many calories as the rest of the team. I can't argue with that logic. This was the flavor that the office was the most interested to try, and it was a little hard to place at first. It definitely reminded me of Fresca, with a touch of 7up. I'm a big fan of Fresca, usually with a healthy shot of gin, so White Out was my favorite of the bunch. Who knows if or when White Out will be in stores but I highly recommend trying it out when you can. And the Doritos? As always, they were delicious, but perhaps more so because they were so wonderfully paired with a sugar & caffeine-induced high. I should be able to sleep in a week or two.